Nearly half a million people who have been labeled as felons for possessing a plant, could see their cannabis convictions cleared in California. While hundreds of thousands of Americans have had their lives ruined by cannabis convictions after they were labeled as felons and forced to spend years in prison, as many as 500,000 people could see their convictions cleared under a new provision in California. Eunisses Hernandez, a policy coordinator at the Drug Policy Alliance, told the Post that he believes as many as 1 million people also have reviewable convictions on their records. “We worked to help create a legalized and regulated process for legal marijuana, but we also wanted to make sure we could help—some way, somehow—repair the damages of marijuana prohibition,” he said. It is no secret that a marijuana conviction is a blow to individual freedom—even if you were lucky enough not to go to jail or have already gotten out. A drug conviction limits the ability for people to get a job, borrow money, or even find a place to live. This attack on freedom then leads to a function known as recidivism which limits an individual’s choices thereby fostering an environment which will lead to that person ending up back in jail. Those at the top—who keep the drug war going—know about recidivism and actually foster it which creates an endless cycle of victimless crimes to fund the prison industrial complex. Sadly, evidence of this tendency to foster recidivism appears to be built into the process of overturning convictions. While individuals with cannabis convictions now have the option to present their cases in court, and to receive decisions under the state’s current cannabis laws, the Post noted that many of those with low incomes either do not have the time or the means to commute to court, or they are unaware that they are eligible, as the state has put little effort into communicating the change in policy. Cannabis is currently legal for medical use in 21 states, and it is legal for recreational use in Alaska, California, Colorado, Maine, Massachusetts, Nevada, Oregon, Washington and the District of Columbia. A survey conducted by Harvard-Harris Poll in July found that 86 percent of Americans now support cannabis legalization in some form. The poll also found that 72 percent of Americans support no jail time for individuals who are found possessing small amounts of cannabis—even if the plant is illegal. As Harvard-Harris Co-Director Mark Penn told The Hill, Americans are finally starting to view cannabis as the plant that it is, separating it from drugs that are classified as “Schedule I” substances at the federal level. 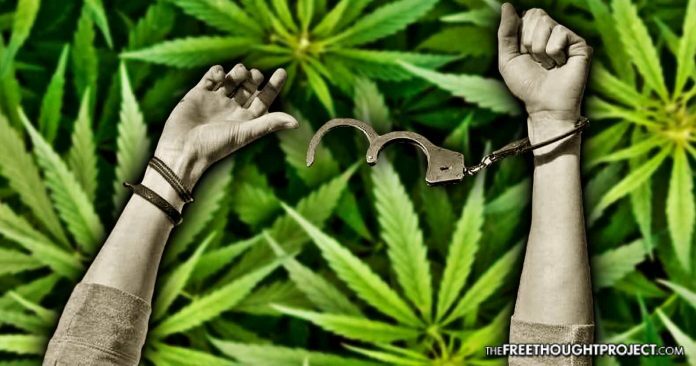 As The Free Thought Project has reported, enforcing strict cannabis laws has only increased the police state, ruined the lives of nonviolent offenders who are found possessing a plant, and enabled a failed “War on Drugs” under the guise of keeping Americans safe, when in reality, legalizing cannabis has been proven to reduce crime.